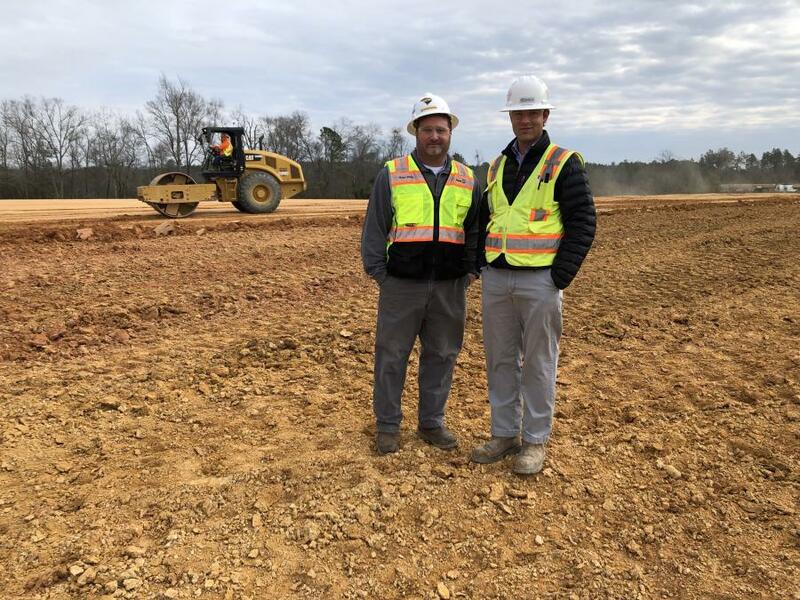 Heath Hanna (R), president of Contour Mining & Construction, visits a work site with Brian Smith, territory manager, Columbia, Blanchard Machinery. With a fleet of more than 30 machines and a diverse portfolio of projects, crews from Contour Mining & Construction are always on the move. 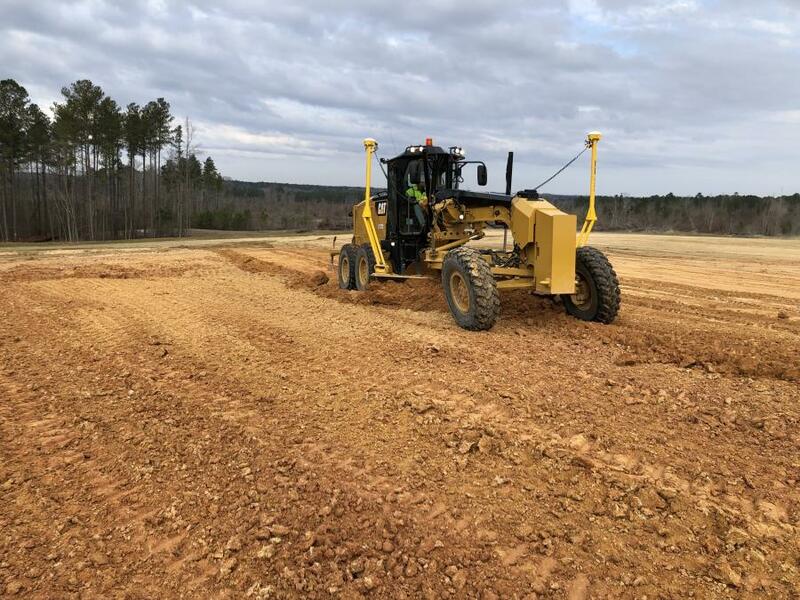 Founded in 2012, the Columbia, S.C.-based contractor can do just about anything associated with civil construction in the Carolinas and Georgia, whether it's land clearing, grading, mass rock excavation, utilities drilling or blasting. 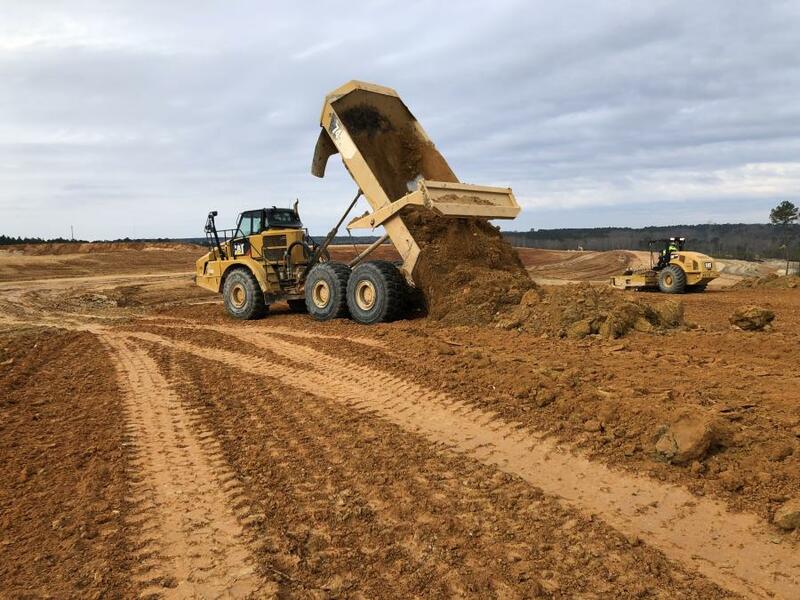 "We work in all sectors, from gold mining to aggregate production to mining and sand — basically, the whole gamut," company founder and President Heath Hanna said in an interview. "We usually have around 10 projects in various stages. We keep our gear moving from job to job, and not parked up waiting on another project." Given the wet conditions on the job site, Contour relied on excavators and trucks to handle the initial excavation before bringing in its fleet of rigid frames. On a recent stripping project, the company moved 7,000 cu. yds. of earth per day on a 100-acre site, for a total of 1.2 million cu. yds. — and in wet winter conditions that called for lighter equipment than would normally be used. After initially considering the use of scrapers, Hanna opted instead for excavators and trucks. 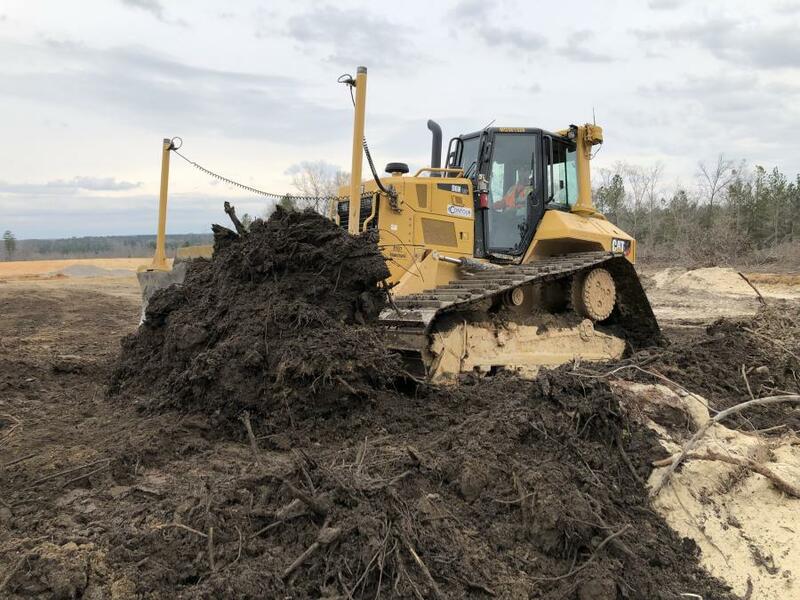 "We looked at running Cat 627s," Hanna said, "but there is a high water table here in areas where it is only 15 feet deep, so the use of scrapers was going to be extremely limited. "Because the material is wet, it makes for tougher underfoot conditions, so the trucks have done a better job. Once we get into rock, we'll move our fleet of rigid frames in to handle most of the excavation." Because the volume of earth to be moved was high, and the margin was low, uptime became the most crucial factor in turning a profit. 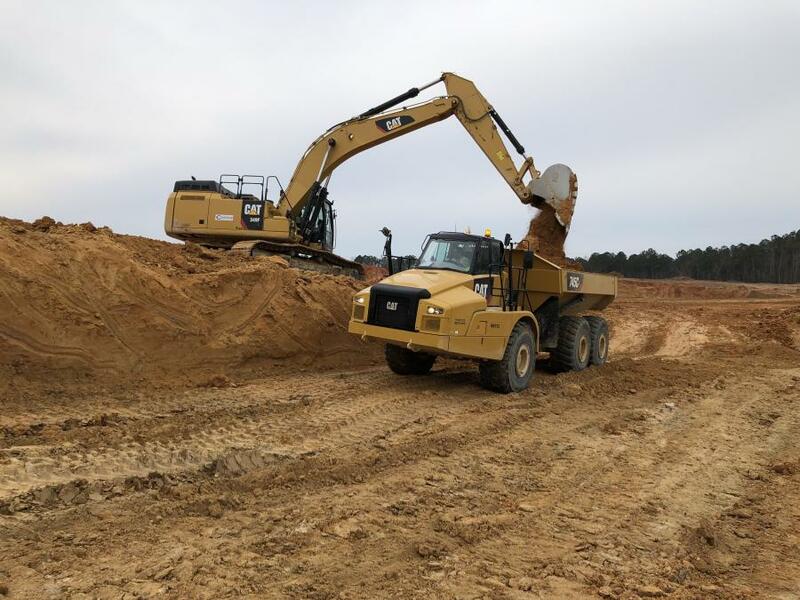 "Production is everything," Hanna said, and to keep the earth moving, he relies primarily on Caterpillar equipment from Blanchard Machinery, whose headquarters — like Contour's — is in Columbia. "The service and response are the biggest thing to us, and we get excellent response out of Blanchard," Hanna continued. "They keep us moving all day. Whether it's a small repair or a larger repair, they are usually on it, and we have very little downtime." 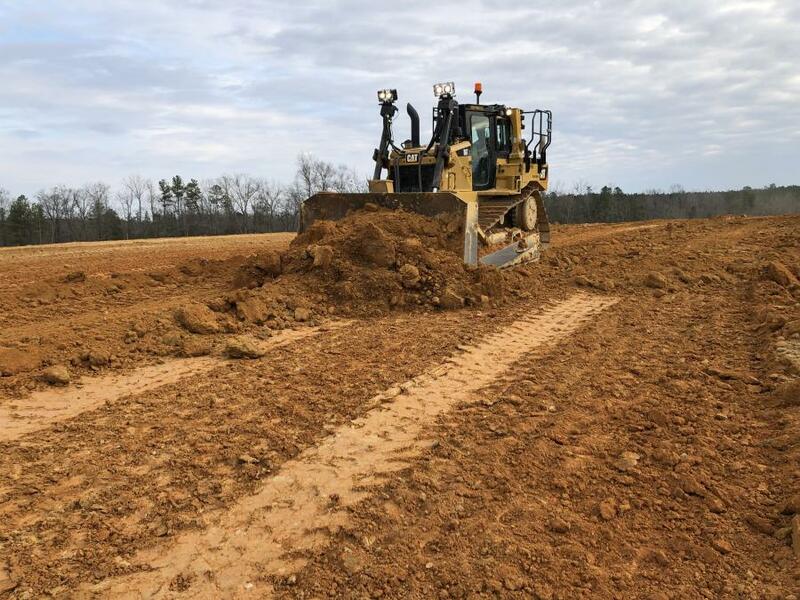 On the stripping job, Contour used Cat 349F excavators, 336F excavators with Trimble GPS, a D6T XL dozer, a D6N LGP with Trimble GPS, and Cat motorgraders and compactors, as well as other machines. Contour's Cat D6N LGP is equipped with Trimble GPS. "Probably the biggest challenge has been the change in material," Hanna said. "We've got a layer of decomposed granite with a high mica content that locks the moisture in. We had to employ a tractor to do additional conditioning for the material so it could meet compaction density specs." Hanna has been fascinated by heavy equipment for as long as he can remember. As a teenager, he worked in his father's HVAC business, until the summer his dad got him a job in the grading company owned by his friend Joe Vaughn. "You are going to work with Joe this summer," his father told him. "You love heavy equipment, and if that's what you love to do, then you need to go and try it and see if that's what you want to do. If you don't, you can come back here and do HVAC." Hanna never looked back. After obtaining a degree in economics from Wofford College, he worked for seven years for Yancey Bros., the Cat dealership in Georgia, which gained him contacts in the mining industry and experience in consulting on a variety of quarry and mining projects. It also earned him a Cat dealer instructor certification. "I did all the production studies for the quarries and mines, and I helped customers decide on the best fleet," Hanna recalled. "Was it scrapers? Was it trucks? Was it rigid frames? Was it a mix? The biggest challenge in Contour's stripping job was the change in material, as a layer of decomposed granite with a high mica content locked in moisture. "So that is my background — big dirt, heavy civil. Out of that, this company was born. I had all those people I had consulted for in the business, so it was a natural fit to be invited to do some of the work." The rest, as Hanna likes to say, is history, and he is working to ensure that history will go on being made. By promoting the construction industry as a viable career option, he hopes to pass his fascination with heavy equipment on to a new generation of workers. There really is no shortage of labor in the construction industry, Hanna said. The problem, rather, is that the industry has not done a good job of promoting itself as a viable career option. "We've got operators here who start out making more money than the average college graduate with a four-year degree," he said. "It's one of my personal goals to tell the story of what we're doing every day and to celebrate this industry." In addition to earning a good living for themselves and their families, Hanna said, construction workers have the satisfaction of seeing the tangible results of work endure for decades. Years after a job is complete, they can drive past it with their children or grandchildren in the car and say to them, "I built this." Contour's Cat D6T XL dozer, acquired from Blanchard Machinery, provided much of the muscle on a recent stripping job. "People look at construction as dirty, and if you don't go to college then you're a failure," Hanna continued. "But, you know, I am of the opposite impression — there is a lot to be said for people who work long hours and deal with tough conditions. They are rewarded and compensated well for it." In 2013, South Carolina Gov. Nikki Haley appointed Hanna to the state Mining Council, which advises the governor on mining issues and considers appeals to decisions made by the state Department of Health and Environmental Control. Hanna is one of three industry representatives on the council, whose mission, according to the state website, is to "improve the quality of life of the citizens of South Carolina by promoting the conservation and wise use of mineral resources within the state." It is a mission Hanna takes seriously. As he sees it, being an industry advocate also means holding companies to high professional and safety standards and ensuring they remain good stewards of the environment. "If you are a producer and you do not do the right thing, then all you are doing is creating a negative impression of the rest of the industry," he said. "We try to make sure that everybody is held to the same standards."